Ader designed three craft, the Eole, the Avion II, and the Avion III. The Avion II was never completed. The Eole made a short flight, but luckily was unable to sustain itself, as the craft had no tail and no method of lateral control: a recipe for disaster. 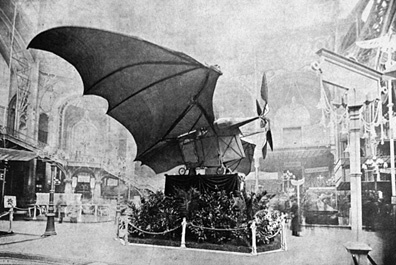 Ader built the Avion III in 1897. It was tested late that year, but never flew. The design is obviously patterned after a bat. 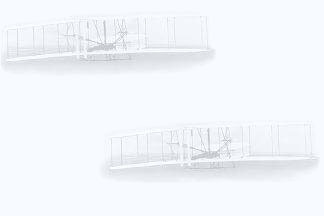 Like a bat, the wings of the Avion III could be folded for storage and transportation. Like the Eole, the Avion III lacked any means for controlling the craft in flight. The above is my opinion as of May 1, 1996. However, there is usually more than one side to any story, and the same is true for Ader. You may wish to visit a new site that provides a different perspective: The Clemént Ader Home Page for a different perspective and set of conclusions. Given my respect for Gibbs-Smith, I want to look over the material carefully before changing my mind. The site has several great illustrations of Ader and his machines.